Top-Flo® Air Relief Valve TL60ARV is double seated. The lightweight ball is freely moving and depending on pressure conditions will close against the upper or lower seat. 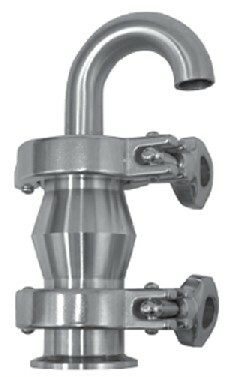 This Top-Flo® Air Relief Valve TL60ARV is not designed for use in operation with liquids having less than 1.0 specific gravity. The Top-Flo® Air Relief Valve TL60ARV can be mounted on the top of a pipeline or container to bleed a pipeline where an air pocket may have formed during operation. Bleeding a pipe on the suction side of a pump will be automatic. Air binding will be prevented. These Top-Flo® Air Relief Valves TL60ARV are found mounted on the top of the inlet pipe in front of the pump. Top-Flo® is a Registered Trademark of Top Line Process Equipment Company. The valve can be mounted on the top of a pipeline or container to bleed a pipeline where an air pocket may have formed during operation. Bleeding a pipe on the suction side of a pump will be automatic. Air binding will be prevented. These valves are found mounted on the top of the inlet pipe in front of the pump.